Stylish comfort and ocean views welcome you in 188 square feet of beautifully designed comfort. 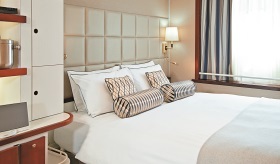 Your queen bed (which can be separated as twins if you prefer) is swathed in luxurious Egyptian cotton linens. 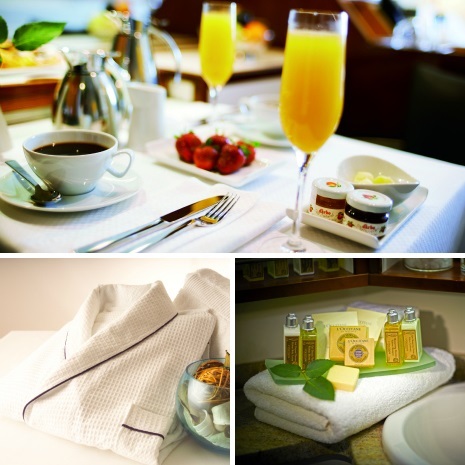 Before or after you enjoy an invigorating massage shower with soothing L’Occitane® bath products, wrap up in your waffle-weave robe, have a snack from the fresh fruit bowl, or simply stretch out and smell the flowers. With 376 square feet, you’ll find the perfect space for time together — and plenty of room for time to yourself. You’ll even enjoy two full separate bathrooms. 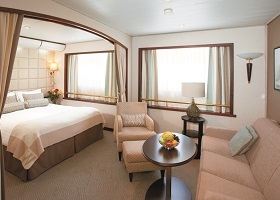 All the amenities of the staterooms await you, plus a beautiful sitting area, and two flat-screen television sets with DVD players. 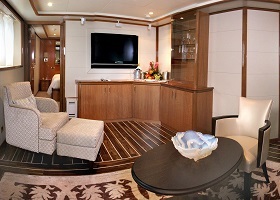 The ultimate in space and style surrounds you in 495 square feet of pure indulgence. Separate bedroom and living room with an in-suite dining area is an invitation to relaxation. And possibly best of all, your expansive bathroom features both a whirlpool spa tub and a massage shower.